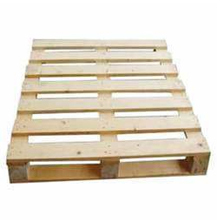 Four Way Wooden Pallets are the most preferred choice among logistic companies for shipping and transport purpose. These can be easily lifted from four sides and stacked on another for effective storage. We use hard wood like Neem and Bamboo for manufacturing these pallets and this ensures complete protection from termites and other wood bore insects.